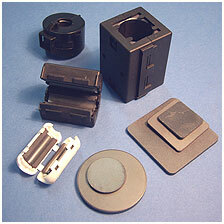 For a variety of RFI/EMI shielding and grounding applications – conductive flexible and structural conductive adhesives. 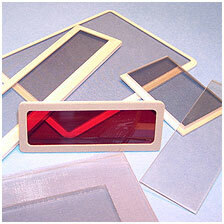 Electrically conductive materials comprising of a silicone RTV and conductive particles. 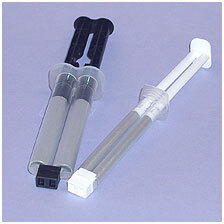 Easily applied to panel joints/seams and small clearances. 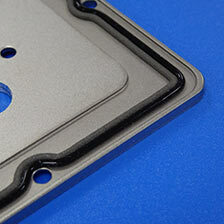 High performance EMI gasket materials that provide optimal shielding effectiveness & excellent environmental sealing. 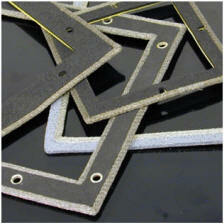 Electrically conductive fabric over-foam gasket sections are formed by wrapping a conductive (or metallised) fabric over a foam elastomer core. 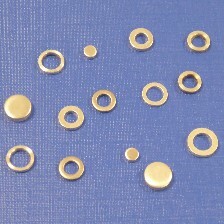 A synthetic textile yarn uniformly plated throughout its cross-section to provide consistent low resistivity. 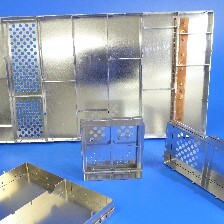 Shielding Ventilation Panels and filters primarily designed to allow unrestricted air-flow whilst preventing the transmission of electromagnetic interference (EMI). 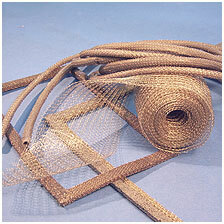 Extremely flexible and durable with a good resistance to tearing. 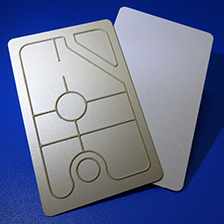 Uniformly plated throughout its cross-section to provide consistent low resistivity. 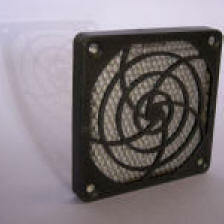 Particularly resistant to abrasion. 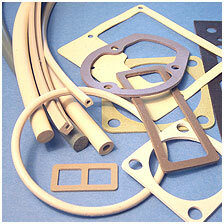 Arange of Connector Gaskets material types. 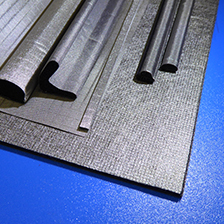 Low and high compression forces, corrosion problems, high temperatures and poor fittings all overcome by appropriate material selection. 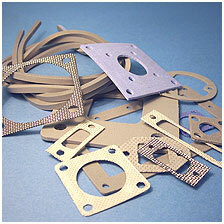 Solid and sponge silicone gasket material populated with vertically oriented monel or aluminium wires up to 140/sq cm. 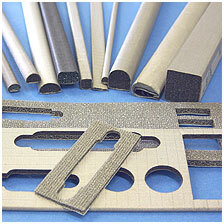 Excellent low contact resistance and high level of environmental sealing. 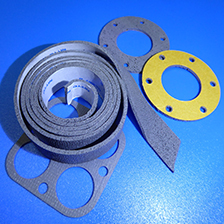 A combination gasket available in a variety of permutations of mesh and elastomer, to combine excellent EMI performancewith dust, environmental, or pressure sealing capability. 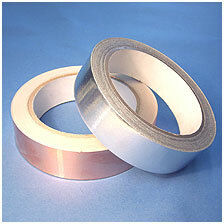 Copper foil, Aluminium foil, Tinned Copper foil and Nickel over copper metallised synthetic textile yarn tapes. 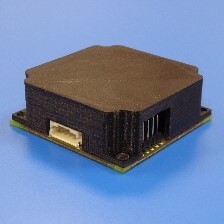 Effective isolation of board level components and the most cost-effective production method. 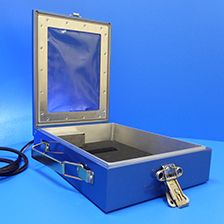 Being custom made, the cans can be manufactured toincorporate a range of design features to suit individual applications. 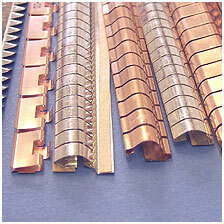 Monel, Aluminium, Stainless Steel or Tin plated Copper clad Steel wire into continuous sections or strips. 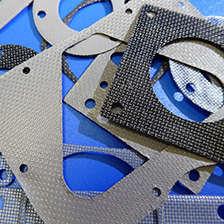 A range of tough, resilient gasket sections that offer excellent shielding performance. 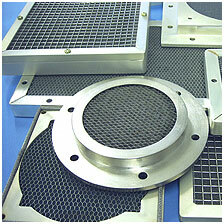 Low-cost EMI Vent Panels for use with 40mm, 60mm, 80mm, 92mm & 120mm fans. 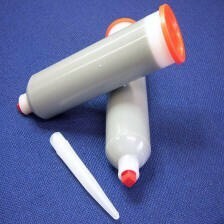 Available ‘off the shelf’ for fast delivery. 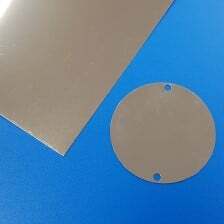 Mu-metal is a nickel–iron soft ferromagnetic alloy with very high permeability, which is used for shielding sensitive electronic equipment against static or low-frequency magnetic fields.